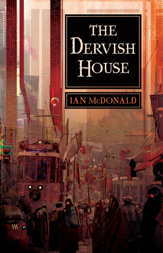 The Dervish House by Ian McDonald is the kind of science fiction novel that rewards the attentive reader. It begs its fans to create timelines and diagrams and carefully-plotted maps of the characters’ paths through the Queen of Cities. I felt I was missing layers of meaning, and if I just took the time to do the math, to make a map, I could discover the clever synchronicities and hidden stories that I missed on my first read. It may just be an illusion created by the quantity of detail crammed into this book, but I wouldn’t bet on it. The Dervish House covers a week in the lives of a group of people in Istanbul as they move through a morass of religion, technology, terrorism, commodities trading, and deals made over ancient artifacts. The drama begins when a suicide bomber strikes on the tram line. Nobody except the bomber dies — that wasn’t the point of the attack. The effects of the explosion ripple outward. One character miss a job interview. Another send his Kid Detective spy robots out to see what happened. Still another makes a note of how high the stocks for a bombing had gotten on the Terror Market. From there, events spin out of anyone’s control. One of the last Greeks in Istanbul must finally face the consequences of his misspent youth. A group of day traders conspire to divert crude oil from Iran’s radioactive oil fields to Baku, and thereby turn themselves into instant millionaires. A nine-year-old boy hunts for terrorists while the squatter in his basement sees visions of djinni. Across the street, a woman searches for the tomb of a mummy who was embalmed in honey — the legendary Mellified Man, whose flesh is said to have healing powers to rival a unicorn’s horn, and who may have never existed in the first place. From a science fiction point of view, one of the more interesting aspects of The Dervish House is the way McDonald makes nanotech scary without resorting to a gray goo scenario. In fact, explicitly denies that scenario. He points out that we already live in a world filled with replicating micro-bots: We call them bacteria. The problem with nanotech is not that it might drown the world under a blanket of ooze, but that it could be used to reprogram the human mind on the scale of an epidemic. Simultaneously, he presents this as nanotech’s great promise — that we could turn every person’s body into a living computer of vast capacity. I first heard of Ian McDonald in discussions of The Windup Girl. The Dervish House has the same sort of complex plotting and frenetic pace as The Windup Girl, but with far more complexity and optimism and both in the setting and in the characters. Yes, there is global warming to deal with, and nasty geopolitics, and the threat of technology used for evil, but there is also beauty and hope in McDonald’s Istanbul. In a way, The Dervish House calls to mind my favorite parts of my beloved cyberpunk — flying through filthy, glorious cities, watching brilliant people struggling in the space between corrupt governments and ruthless corporations. The Dervish House is supremely clever. I have a feeling that I’ve missed many of the jokes (although there are some good ones about a science fiction writer who plays a minor role in the story). A reader who is knowledgeable in Turkish politics and history would probably get much more out of this book than I did. However, The Dervish House contains enough detail to get its readers through the various intrigues without resorting to tedious infodumps. This is probably not a book that will change your life, but it is a lot of fun.